High quality mitt for safe cleanings! For a premium washing media the Rag Company Cyclone Premium Wash Mitt is a high performing option you will love! It safely removes contaminants so you get a thorough cleaning for the perfect start to your detail. The Cyclone mitt is made in South Korea from high quality microfiber strands with a breakdown of 70% Polyester / 30% Polyamide. The long fibers are double stitched into the mitt for enhanced durability which help ensure the mitt will last a long time. These fibers can safely break up contaminants and encapsulate dirt and grime when paired with a quality shampoo. This pulls the contamination from the surface, allowing the mitt to glide across the surface with low friction, reducing the chance of any possible wash-induced imperfections. Measuring 10" x 10" you get a whopping 200 square inches of surface area to work with! 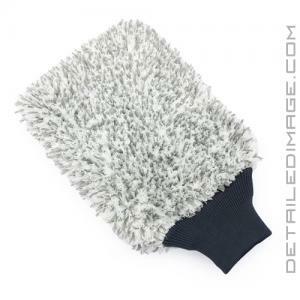 When you are finished washing, you can wash this mitt like you would with any other microfiber towel. Machine or hand wash with cold water and microfiber detergent free from dyes, fragrances, bleach, and softeners. Tumble dry on low heat or let the mitt air dry. If you are looking for a high-quality wash mitt, reach for the Rag Company Cyclone Premium Wash Mitt!